I’ve posted numerous analyses showing that the economy has done significantly better under Democrats than Republicans. The data is clear that if you want a shot to make more money or want to improve stock market returns, vote Democratic. Today Bloomberg has analyzed the data to also show that if you want more private sector jobs, vote Democratic. Democrats hold the edge though they occupied the Oval Office for 23 years since Kennedy’s inauguration, compared with 28 for the Republicans. Through April, Democratic presidents accounted for an average of 150,000 additional private-sector paychecks per month over that period, more than double the 71,000 average for Republicans. Through April, private employers have added an average of about 900 jobs per month since Obama’s inauguration. During the two terms of his predecessor, Republican George W. Bush, private payrolls shrank by an average of 6,700 jobs per month. On a monthly basis, Democrat Bill Clinton averaged 217,000 new private-sector jobs. Democrat Jimmy Carter had an average of 188,000, followed by Republican Ronald Reagan’s 153,000, according to Labor Department data. 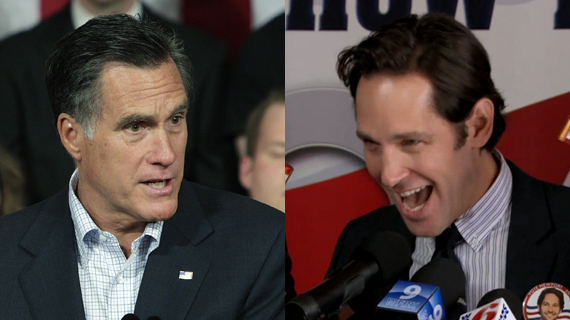 On Parks and Recreation Paul Rudd plays Bobby Newport, an empty-headed political candidate for the Pawnee city council who is only able to run because of having a rich father.While I do not think Mitt Romney is as ignorant as Bobby Newport, the similarities between the two are obvious. Comedy Central has looked at the two to try to determine which is more electable. If you are only interested in the results and now the full analysis, it was a tie. Campaigning in the backyard of America’s auto industry, Mitt Romney re-ignited the bailout debate by suggesting he deserves “a lot of credit” for the recent successes of the nation’s largest car companies. Romney has repeatedly argued that Obama ultimately took his advice on the auto industry’s woes of 2008 and 2009. But he went further on Monday by saying he deserves credit for its ultimate turnaround. With the media so often showing a faux objectivity by quoting statements from both parties as if equally valid, regardless of the facts, it is good to see that this report from AP explicitly points out that what Romney is saying now differs substantially from what he said at the time. Catching Romney lying is quite easy to do–just wait for his lips to move. Even before this whopper, Steve Benen was up to Volume XVI of his ongoing chronicles of Romneys lies. Previous lists of Romney lies are available here: Vol. I, II, III, IV, V, VI, VII, VIII, IX, X, XI, XII,XIII, XIV, XV. Prior to this one, David Corn considered Romney’s biggest whopper to be a lie that the government will control over half the economy under Obama. I wonder if this will replace it. The Obama campaign calls this “a new low in dishonesty” and is calling on Romney to have “the courage and integrity” to admit he was wrong. For those who want to go through the record as to what Romney has really said about the bailout at various times, Jed Lewison gives a good play by play. Steve Benen has more. The bottom line is that Romney opposed Obama’s proposals at the time, and if we had followed Romney’s plans we would not have a recovering auto industry in Detroit today. Republicans hate Joe Biden’s elevator pitch that Bin Laden is dead and G.M. is alive, but both parts are true, and reasons to reelect Obama.